It's been teased and previewed and discussed and debated, and now the concept is real: The Audi e-Tron Quattro Concept debuted at today's Frankfurt Motor Show. A styling concept that is thought to reach production as the Audi Q6 , a more coupe-like crossover utility vehicle similar to the BMW X6, the key feature of the concept car is its all-electric drivetrain. Like the Porsche Mission E electric four-door sedan concept that also debuted here, the e-Tron Quatto Concept previews a production electric car that targets Silicon Valley startup Tesla Motors [NSDQ:TSLA]. The production version of the electric SUV isn't expected to be offered for sale until early 2018, but the concept car underscores important facets of the vehicle that will roll off assembly lines in about two years. Audi is keeping its costs down by using a VW Group architecture shared with several other vehicles. That MLB Evo platform is said to be designed from the ground up as an electric car, including a totally closed underside. That helps the vehicle achieve what Audi claims is a drag coefficient of just 0.25, equal to that of the third-generation Toyota Prius hybrid (although Cd figures from different makers are not necessarily directly comparable). The battery-electric drivetrain features three electric motors: one at the front, and two on the rear axle, providing a total of 496 horsepower and 590 lb-ft of torque. Real-time torque management directs current to each motor to maximize traction and minimize energy consumption. The three motors in the electric concept are powered by a 95-kilowatt-hour battery using lithium-ion cells from Korean makers LG Chem and Samsung SDI. It sits under the floorpan running from side to side, and from the front to the rear axle. Audi claims acceleration from 0 to 62 mph in 4.6 seconds, and a top speed limited to 130 mph. The company claims a range of 310 miles with moderate driving, though that figure likely uses the European NEDC test cycle, with a comparable EPA range estimate being 20 or 30 percent lower. 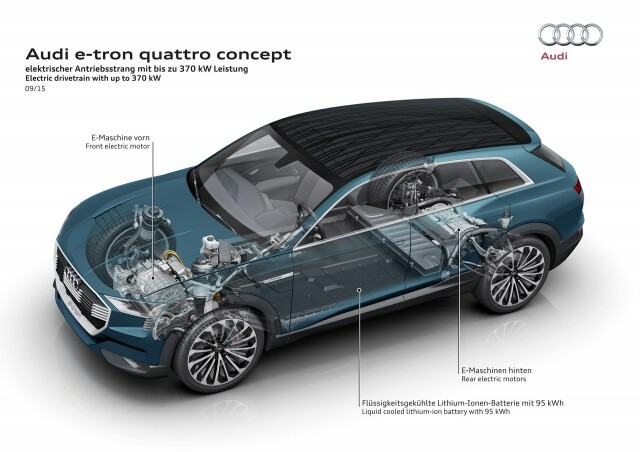 Using a 150-kilowatt DC fast charger, Audi says the e-Tron Quattro Concept can be fully charged in as little as 50 minutes. Autonomous parking also permits wireless charging without the driver having to position the car exactly over the charging plate. And perhaps inevitably for an electric concept car, a roof-mounted solar panel can incrementally recharge the battery on sunny days. The four-seat interior features separate ventilation outlets for each passenger, multiple display screens, and other elements adapted from the Audi Prologue Concept it showed at last fall's Los Angeles Auto Show. 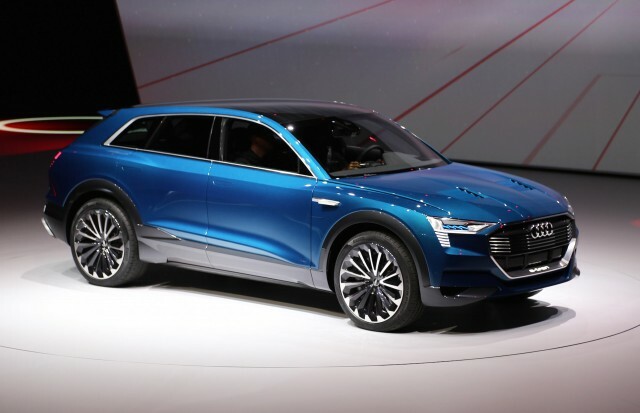 The e-tron concept falls between the existing Q5 and Q7 SUVs, and Audi is also investigating other powertrains. These would almost surely include a plug-in hybrid, using components from the VW Group family of scalable components, and possibly a hydrogen fuel-cell version if Audi becomes convinced that there is a market for that technology. While the Porsche Mission E concept seems likely to aim somewhere between the Tesla Model S and its planned Model 3, the Audi e-tron will target the Tesla Model X--although seemingly with a smaller vehicle. But the two different all-electric cars from two different prestige brands at Volkswagen Group indicate how seriously that company--one of the world's three largest automakers--takes the threat from high-end electric cars. Press days in Frankfurt begin today. To keep up with all of our latest coverage, head over to our Frankfurt Auto Show news hub.